The level that police will go to defend their own is astounding. Now…before you go calling me a “cop-hater”, lets get a few things straight. I admire and respect the police. My next door neighbor is a cop. Guy across the street? Cop. Guy four doors down? Cop. My friends and neighbors. And I respect them and the job they do, knowing full well I couldn’t do it. Did I neglect to mention MY DAD IS A COP? And, I LOVE my dad. So, nothing against cops themselves. But, to remove all bias that you might think I’d have…you know, being mouthy, brown, and writing about cops…I’ll stick to JUST the FACTS, and let you draw your own conclusions. I will clearly mark any OPINION of mine, so that you can ignore them. On August 31st, 2016 Evan Parish Matthews posts photos to his Facebook account that purport to show Officer Ian Hans Lichtermann of Northeast Philadelphia’s second precinct. The photos were taken in Philadelphia during a march that was held while the Democratic National Convention was in town. On Officer Lichtermann’s forearm is a tattoo of an eagle, and above it, in a gothic Germanic font is the word “Fatherland”. This prompts speculation that Officer Lichtermann is either in support of or aligning himself with Nazi or White Supremacist ideals. 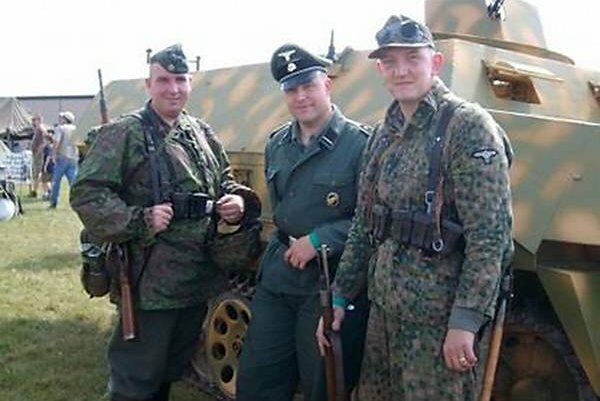 Several local news sites, such as Philly Voice and Philadelphia Magazine report that Officer Lichtermann has Flickr and Instagram accounts that show him in Nazi uniform, re-enacting Nazi battles, and several old file photos of Nazi leaders from WWII. Officer Lichtermann (or someone with access) quickly deleted these accounts, but, the evidence is still available online. A public outcry ensued, with much more information being found online, such as a claim that in a hack of Neo Nazi websites back in 2010, Officer Lichtermann’s name was found among those who were members of “Blood and Honour“, a”a neo-Nazi music promotion network and political group”. His online name is “PanzerHund” (“tank hound”), and he has a dog named “Rommel”. Philadelphia’s mayor, spoke out against the tattoo saying, “I find it incredibly offensive, and I know many others do as well. This image is particularly offensive to our WWII veterans who fought valiantly to free Europe from Nazi Germany, as well as all victims of Nazi atrocities. In this environment – in which open, honest dialogue between citizens and police is paramount – we need to be building trust, not offering messages or displaying images that destroy trust.“. A trip on over to the website for this German-American police association, the IGAPA, shows that, yes, the symbol is an eagle. Although it is nothing like the one in the tattoo, nor is the word “Fatherland” included. The IGAPA symbol shows the “Bundesadler” (“Federal Eagle”), which is on the German coat of arms (“Reichswappen“). The tattoo Officer Lichtmann bears is the “Partieadler” (“Party Eagle”) which is the symbol of the Nazi party. Except for that one sentence up there where I was forced to draw a conclusion based on previous evidence, this is all FACT. None of it is conjecture or supposition. These are the facts plain and simple. Now it’s time for YOU to form an opinion. Officer Lichtmann is serving in an area of Philadelphia where nearly half of the souls he protects would not be accepted by the political party whose symbol he wears on his arm. The party whose battles he re-enacts and uniform he likes to wear in his spare time. These people would not have been spared by the man he named his dog after. Should we be celebrating this man? Should we give him a pass? And should we still be surprised when members of the other 43.5% of his patrol area might fear him (and men like him all over America)? The vast majority of police officers in the US are decent men and women who are doing a thankless, dangerous job for what is not nearly enough pay. But, until the good majority also starts pushing out the bad apples that are giving all of them a bad name, we’ll never be able to move on from stuff like this. If a doctor is bad, guilty of malpractice, or worse, every doctor….even those who don’t personally know him or her, lines up to say “Get the hell out of my profession”. The same holds true for every other profession…plumbers, carpenters, merchants, web designers, lawyers….well…maybe not lawyers. ← Is Trump a bigot? Or just a bigot magnet?